In the past weeks I have been asked several times about how to migrate off Oracle and on to DB2. Let me give you a quick overview of the technical side, for the financial part you have to ask an IBM business partner or an IBM seller. Although you can move to DB2 from database systems like Microsoft SQL Server, MySQL, and others, I will focus on Oracle because of the compatibility features built into DB2. When moving off Oracle this could be for a SAP system (or other vendor application) or other applications ("non-SAP"). For SAP environments and applications from several other software vendors there is a (kind of) standardized process to migrate a system. The reason is that there are database-specific definitions and feature exploitations. A great example is how SAP is making use of the DB2-only BLU Acceleration to boost performance for analytic environments. Many software vendors provide tools for database migration and related processes or services. For custom scenarios where the application code is available, a manual migration applies. The traditional barrier to a migration, the (more or less) incompatibility of products, has been torn down by adding compatibility features to DB2. Some of those features come ready to use by any user, some require specific preparation of DB2 because they may impact the traditional handling/"look and feel". The DB2 Knowledge Center has a good introduction and overview into that topic: "DB2 Compatibility Features". If you are comping to DB2 with a background in Oracle then use the Terminology Mapping to discover how products, features, and commands are named in the world of DB2. If you prefer a book instead of the DB2 Knowledge Center, then I recommend the IBM Redbook "Oracle to DB2 Conversion Guide: Compatibility Made Easy". It gives an overview of DB2, the tools needed for a migration in a non-SAP environment, and the conversion approach. In the appending you will also find a nice terminology mapping, i.e., explaining how Oracle commands and features are named in the world of DB2. 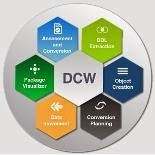 A key tool for custom migrations is the Database Conversion Workbench (DCW). It is a plugin into the IBM Data Studio, a free tool for database administration, design, and SQL development. The DCW allows to analyze a database schema with respect to DB2 compatibility. The result is a valuable foundation for estimating the overall conversion effort. Once that is done (or not needed), the Database Conversion Workbench helps in the process of moving the database schema, database-side SQL packages, and thereafter the data from another database system to DB2. DCW also includes a package visualizer to help understand package dependencies which simplifies the code conversion. See this page for an overview and more resources around the Database Conversion Workbench. An important DB2 feature related to the compatibility is the ability to run PL/SQL code. Several administrative PL/SQL packages ship with DB2 which can be found in the "built-in modules" section. Moreover, there are also some PL/SQL packages that can be used "as is" and are available from IBM developerWorks in the database conversion community: See here for the add-on PL/SQL packages. That's all for now with my overview of resources for the Oracle to DB2 migration. I hope that it provides a good introduction into that (sometimes confusing) topic. BTW: I have been covering many migration-related topics in my blog. Serge Rielau and now Rick Swagerman have provided many SQL tips for DB2 in their blog.